It's not uncommon to see a central vacuum system in a home, but in an RV or boat? About 15 years ago HP products developed a small compact central vacuum for boats and RV's under the Dirt Devil brand. Initially found in upscale motorhomes, over time, manufacturers have found it to be a great option for all types of RV's due to it's compact size and amazing power. Today it's one of the hottest RV upgrades a camper or motorhome owner can make in the battle to keep their RV clean. While many RV's have lost the carpet in place of solid floor surfaces, trying to sweep up after a fun filled camping weekend isn't going to get the floor very clean. It may take care of the big stuff, but the dust and small dirt is left behind. This can lead you to consider packing along an upright vacuum cleaner to try an keep things clean. Unfortunately, RVs don't have a lot of storage space and loosing a big portion of a closet for a large house hold vacuum isn't always ideal. A central vacuum system installed in your unit can give you the cleaning power you need without taking up additional space. The Dirt Devil RV Central Vacuum system for instance measures just 7.5" x 7" x 14.25" and can be mounted under a bed, dinette or even in a storage bay. Many individuals love camping, even those who suffer from allergies and other respiratory issues that are made worse by pollen, dust and other debris that floats around while you camp. These individuals may avoid doing something they love to keep their symptoms at bay. Being able to vacuum your RV on a regular basis can cut back on the symptoms, making camping a more enjoyable experience once again. Both the Dirt Devil and the Intervac RV central vacuum systems feature HEPA filtration preventing the dust and pollen from being spread in the air during vacuuming. Most people understand they can clean the inside of their RV with their central vacuum. When that large bag of open chips hits the carpets or furniture you can quickly and easily have the mess vacuumed up with your central vacuum at the ready. However, with the hoses and other attachments that often come with these systems, you can even clean up spills on the outside of your RV. For instance, perhaps your child put a sand bucket that still had sand in it inside your external storage bay. This mess used to be difficult to take care of. 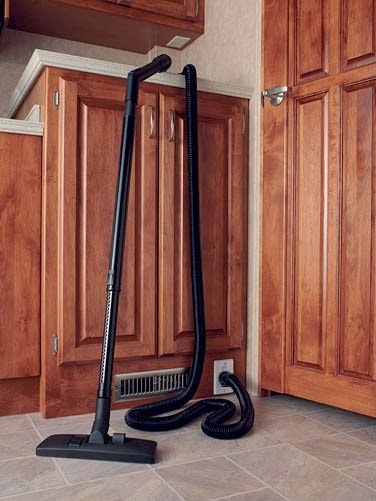 With your central vacuum, you can easily stretch the hose outside and take care of the mess. Installing a RV central vacuum systems in an RV doesn't take a pro either. With just a few tools many times a system can be installed in under an hour depending on location. For those who want a custom installation with possible a few remote inlets and a vac pan for the kitchen, plan a few hours extra to get it just right. Those who camp in RV's often have a difficult time keeping things clean, especially if they camp in areas where there is a lot of dirt or other debris and many little feet entering and exiting the RV. With the convenience of an rv central vacuum system, keeping your RV clean is no longer a major chore. If you are interested in purchasing and installing a central vacuum system in your RV, contact us. We can help you choose the right one and give tips on how to install it so your next trip is cleaner. One concern for most RV'ers is making sure that they have enough power when they go off grid and head into the wilderness. 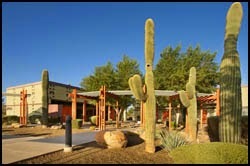 While most commercial and state parks offer on site electrical hookups, that may not be where you would like to spend your whole trip. And if you're thinking of dry camping, or boondocking, one fast and simple way to reduce the amount of power you use is by switching to RV LED light bulbs. A typical 50 watt halogen bulb has a lifetime of 2,500 hours. 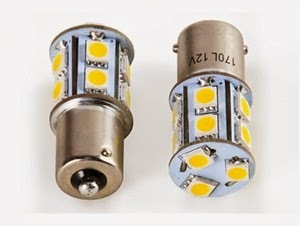 The LED equivalent uses 7 watts of power and has a lifetime of 25,000 hours. Simply switching over to LED's can cut your electricity usage down to 1/7th and increase that trip into the woods comfortably by hours. Halogen bulbs get hot but LED bulbs don't. Those hot bulb discolor plastic lenses and if you have children on board, knowing that they cannot burn themselves on the lights is reassuring. Many people are initially offput by the price of LED bulbs. While they generally cost more upfront, the savings you incur from using less power and having to replace bulbs much less often will save you in the long run. An average LED bulb will outperform (become cheaper) than its halogen equivalent in roughly two and a half years of equal usage. LED bulbs are greener! Having longer lifespans means less trash to throw away and using less electricity makes everyone happier. Still not sure if the switch is right for you? Please contact us. We'd love to hear your concerns, questions and feedback! 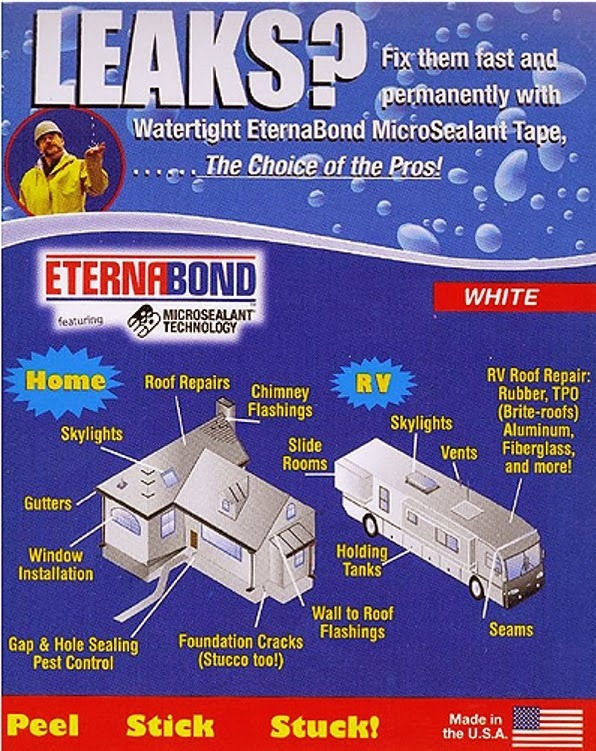 Adding an Eva-Dry Dehumidifier to your camper is one surefire way to beat back condensation problems. The company makes several different models that range in size from petite to high capacity. 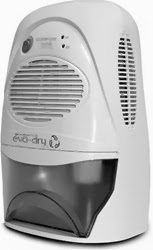 Some of the dehumidifiers, like the EDV-500 and EH-500F, do not require a power source and utilize renewable crystals. Others, like the EDV-2200 and EDV-1100, run on 120v electricity and feature a removable drip container. 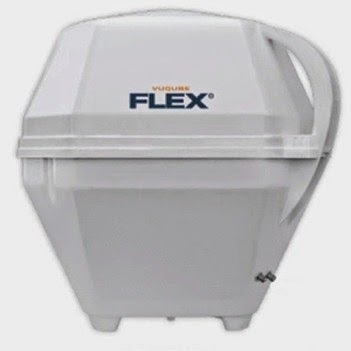 The drip container is designed to be easily emptied and cleaned in between uses. The Dri-Z-Air Company also manufactures a handy condensation solution for campers. It consists of a canister that gets filled with odorless, non-flammable, water absorbing crystals. The crystals are made with a calcium chloride material that will need to be kept away from salt sensitive materials. If you do decide to go with the canister and crystal combination, keep in mind that you may need to buy more than one. 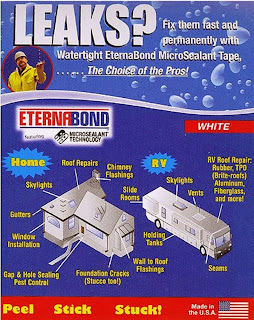 In general, one unit is capable of only controlling moisture in a 10’ x 10’ interior camping space or less. Of course opening a window or roof vent can prove to be beneficial too. It will allow the excess hot air to escape, thereby reducing the camper’s interior humidity levels. There is an array of roof vents on the market today. Some feature power operated doors. Others require manual operation. They may be paired with other camper parts and supplies like Barker Vent Stik/Knob Kits. To make inquires and learn more about camper parts and supplies like these, please contact us at (866) 332-7881.
they are historic sites, campgrounds or other tourist areas. Many new RV owners think they will be able to tour around in their motorhome, but quickly come to the realization that preparing the RV to travel after a nights sleep takes quite a bit of time. Also parking becomes an issue as does clearance under bridges, building overhangs and entry gates. Bikes or walking are an option, but you will miss out on everything other than what is close by to the campground. So wouldn't it be great to have a car or SUV to run around in? Then you could go exploring without needing to disturb your nicely settled in RV. So what are the options? Well, you could go with a trailer which would allow you to tow pretty much any vehicle within the towing limits of your motorhome. But, you have to find a place to store it and loading and unloading will get old pretty quick. A tow dolly is easier to store at your destination, but requires you to tow a front wheel drive car or a car that could be towed 4 wheels down. 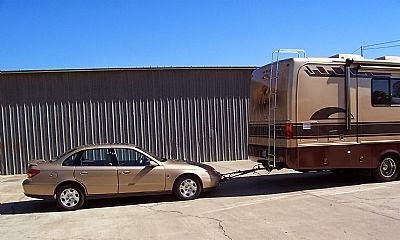 Our almost 20 years of experience towing a vehicle behind a motorhome points to using a tow bar and towing a car or SUV 4 wheels down. And Blue Ox towing products is one of the most trusted name in towing a vehicle behind your motorhome safely and economically. Whether your a budget conscious motorhome owner who only plans to tow a few times a year or a weekend warrior who will be towing through out the camping season, selecting the right components the first time is key. But first the most vital piece of the puzzle is determining if the vehicle you own or plan to purchase is capable of being towed 4 wheels down. Do not assume since you saw another RV'er towing a car 4 wheels down that it can be done, there are factors such as manual or automatic transmission, 2 wheel or all wheel drive or possibly add on aftermarket transmission pumps used. Be sure to check with the manufacturer of the vehicle to be sure! We have also found Motorhome Magazines Dinghy Towing guide to be a great resource. Last year we put out an article called "Blue Ox Towing System For Towed Vehicles" which details everything you need to safely tow a vehicle behind your motorhome which we recommend for anyone researching the subject. It reviews the 4 major components you will need to tow a car or SUV including; a baseplate that is attached to the frame of the towed vehicle, a tow bar which links the tow vehicle and the motorhome, the braking system which applies brakes to the towed vehicle and towing accessories which include wiring kits, safety products and protective equipment. Tow Bar - The Blue Ox Aventa LX, this is a 10,000 lb rated tow bar which will cover most vehicles and features the innovative ball and socket joint design. This tow bar also includes safety cables which are required by law. Baseplate - These are vehicle specific and can be selected here. Braking System - Blue Ox Patriot which is portable and requires very little in the way of installation. This includes a brake away system, again required by law based on tow weight ratings. Wiring - The Blue Ox 7 to 6 way coiled cable kit which extends the lighting from your motorhome to the front of your towed vehicle. And the Demco Towed Wiring Kit which features a plug and play design to activate your towed vehicles brake & taillights. If you would like help in selecting the best towing option for your needs, contact us, either online or by calling toll free 866-332-7881. RVupgrades.com wants to help you have most enjoyable and trouble free RV experiences possible. 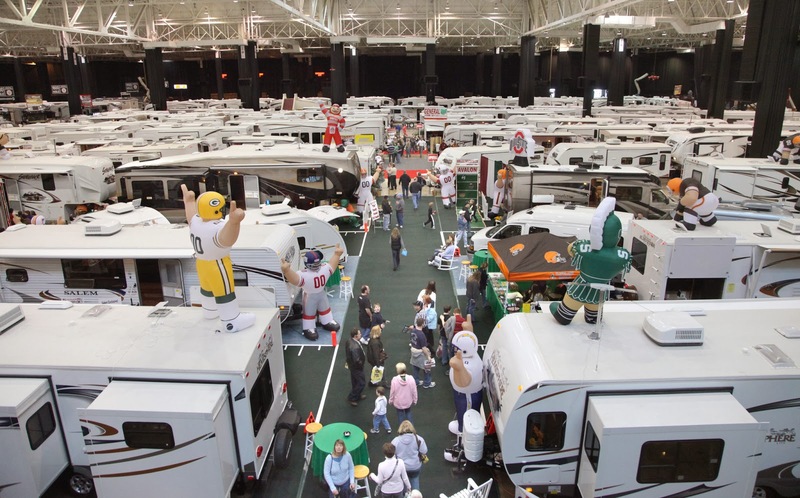 In the past we would wait patiently for RV Accessory manufacturers to release the latest and greatest accessories to hit the market each spring. Traditionally many would tease the product release in March or April and finally have stock available in June. 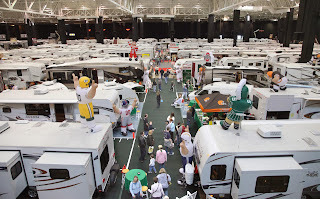 What they didn't realize is that most RV'ers spend the last half of winter researching and purchasing products for spring upgrades. So many of these items would sell poorly due to how late they where released into the market. Well, we are happy to see this tradition begin to loose it's grip on the industry with many manufacturers rushing new products to market at all times of the year. Here are a few RV accessories that we really like to kick off 2014. Check out that compact monitor! With so many in vehicle devices vying for space on your vehicles dash board, we are loving the compact size of this tire pressure monitor. Other great features are the flow through design of the tire sensors and the ability to change out the batteries without sending them back to the manufacturer. Complete systems start with 6 tire sensors at industry leading pricing and monitors will handle up to 22 tire positions as your RV grows. With a show of hands, how many of you have road flares packed away in your truck, motorhome or camper? We are thinking more than a few cannot get that hand up. And you probably have seen that poor family or couple on the side of the road; cars and trucks whizzing by, while they try and change a tire or wait for help with only hazards flashing. Can you say dangerous! Well the Aervoe LED road flare is here to save the day. Line 3 of these a couple of hundred feet back of the vehicle and motorist will have plenty of time to get over and give you room. These compact units are easy to store and even easier to be seen with up to a 1/2 mile range. The road flare is available with warning red LED's or caution amber LED's. Full timers and die-hard RV'ers who sometimes take chances with the weather are going to love this heated water hose. The hose features machined, nickel-plated fittings, self-regulated heated wire which eliminates the need for thermostat or temperature controller (a point of failure in other heated hoses) and a feature we really like, both ends are female. So with the included female-to-male adapter you can more easily position the power plug close to the power source. Heavy-duty heat shrink provides strain relief on both ends of the hose for less stress on the fitting and hose connection. 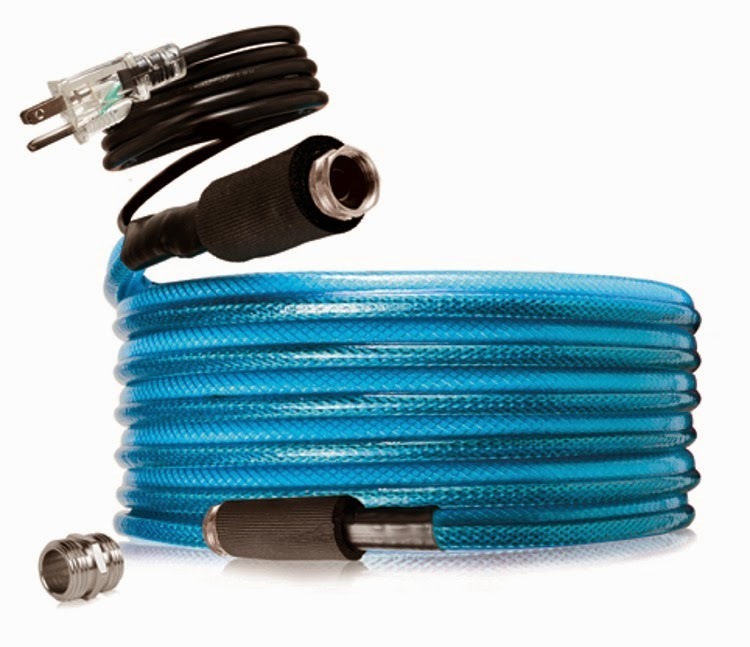 The hose has a 1/2" diameter and is available in 12', 25' and 50' lengths. 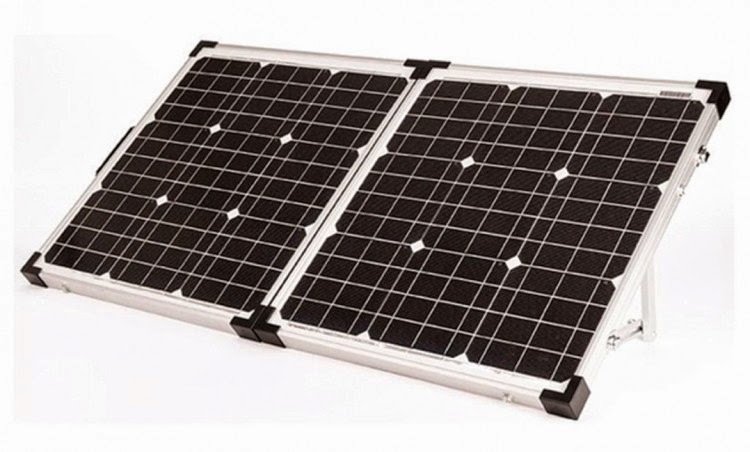 Requires 120V and has a 3 year warranty. To stay on top of all of the new RV accessories that become available this year, check out our New RV Accessories category that is updated almost daily with new products. We think that every dominoes player needs a sturdy, wooden domino tray to keep his or her tiles in order during the game. That’s why Fundex Games’ Domino Trays tops our list of RV accessories for traditional gamers. They are sold four to a box, which is enough to hold 60 dominoes. 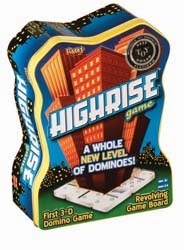 Modern day fans that crave a new variation of the game may appreciate Fundex Games’ Highrise Dominoes too. It comes with 12 spacers, 36 tiles and a square base. The game starts with one player strategically filling the base with eight tiles. The rest of the players are dealt five tiles each. Each player’s mission is to use those five dominoes to cover the base. The tricky part is that each of the five dominoes must touch two matching tiles on the base. The scoring is identical to the traditional game. So the player with the most points wins. Fundex Games also manufactures another version of the game called Mexican Train. It includes 91 tiles, which during the game are referred to as box cars. The set also includes a sound enabled, train station hub and train engine markers. Depending on the number of people in the game, each player is given a marker and 8 to 15 tiles. There is also a marker that’s designated as the Mexican train. Once they’ve been dealt, the players place their markers near the hub. The markers are followed by box cars. Each player gets an opportunity to build his or her own straight train as well as add to the others. The game doesn’t end until someone goes out or all of the moves are exhausted. The person with the most points then gets to make train noises and is declared the winner. To learn more about these items and other RV accessories that are ideal for keeping campers entertained, please contact us at RV Upgrades. Having your batteries go out while traveling can be a very frustrating and costly thing to happen, especially if you don’t have an immediate means of replacing them. Having some type of warning leaves you better prepared to handle a battery problem that might come your way. 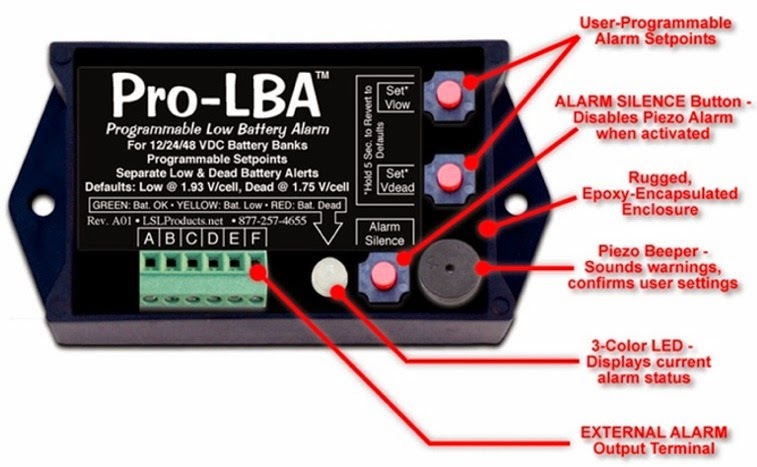 LSL Products has come out with a programmable battery alarm that can alert you when your batteries have reached a low level or are on the verge of dying. 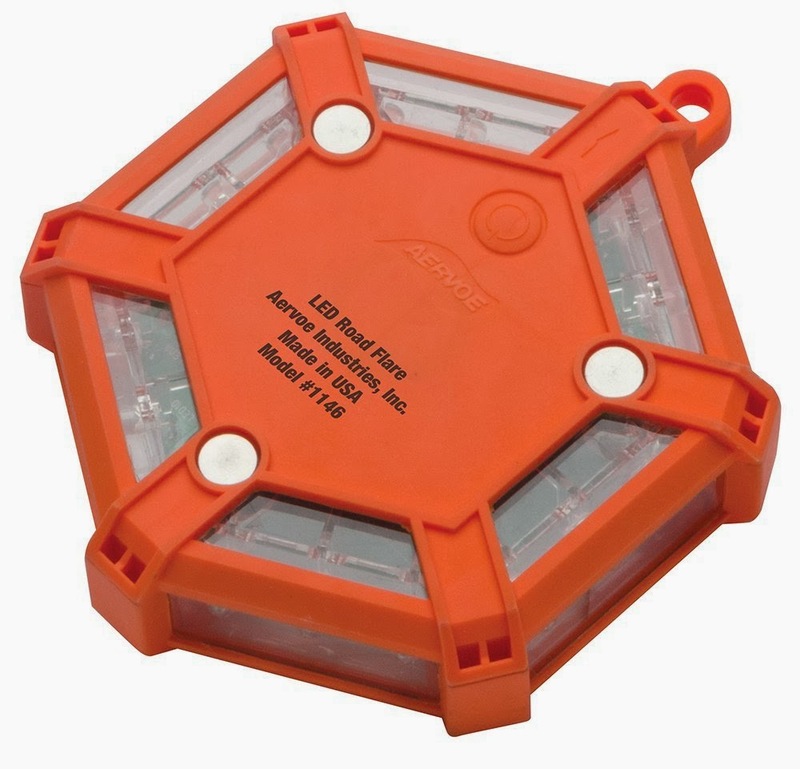 The LSL Products programmable low battery alarm can be customized to your battery’s voltages. It sends out a repeated audio signal when your batteries reach their low point and a continuous signal if they are about to die out. LEDs also give you an easy to see visual indication as to the current state of your batteries. The audio signal can also be silenced if necessary, however the visual alarm will still be active. Batteries are often expensive and having an alarm like the one from LSL products prevents potential damage due to an overdischarge. Overdischarges can decrease the lifespan of the battery, depending on the type being used. This alarm is also able to save your settings, even if it is not connected to a power source. Nowadays, many state parks and federal lands have rules that prohibit ground level or in-ground fires. Some areas also have strict restrictions on which fuel sources may be used to create camp fires. That said, it never hurts to have a backup plan in place. One camping trailer accessory that can effectively serve as a backup is the Camco Little Red Portable Campfire. 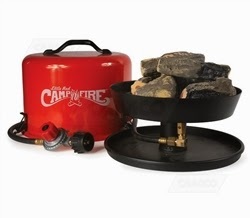 The Camco Little Red Portable Campfire does not run on firewood or charcoal. So there is no need to worry about firewood restrictions or ash residue disposal. It’s a self-contained beauty that runs on regular LP gas cylinders and features ceramic logs instead. The unit comes with a 9.5” ring burner, 11.25” fire tray, carrying handle and an 8’ propane hose for attachment purposes. What we like about the Little Red, besides its self-contained portability, is the BTU output and adjustable flame. It makes achieving the right amount of light and heat very easy. The unit may be feasibly paired with other camping trailer accessories like a freestanding, metal, campfire grill or a couple of Rome Pie Irons. The campfire grill has a stake that is driven into the ground and allows for easy height adjustment. The Rome Pie Irons are compact and keep your Little Red Campfire from getting grease or melted cheese dripped onto the logs. If you do decide to try and cook something over the portable campfire, remember that propane can leave black marks onto the bottom of metal pans. 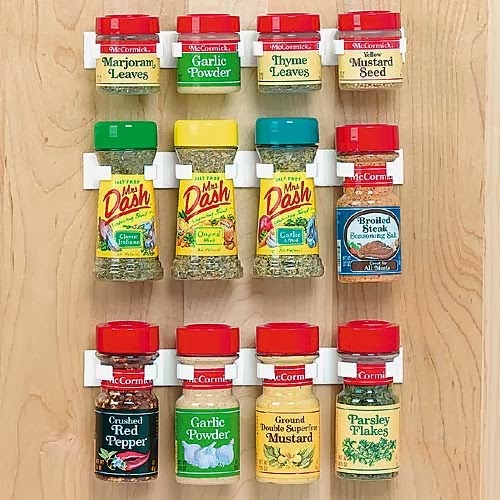 So you’ll want to try and remove them right away or use old cookware. Sometimes submerging the stained pans into a boiling hot, 50/50 mixture of white vinegar and water will help to remove the stains. Commercial cleaners might be of use in such instances too. To learn more about camping trailer accessories like the Camco Little Red Portable Campfire, please contact us at (866) 332-7881. It can sometimes be difficult missing out on the big game or missing out on your favorite shows while on the road. It may feel as if you are out of the loop, and then you have to think about catching up when you return home. Trying to watch TV online over a wireless network or through a hotspot is not always reliable. The King Controls VuQube FLEX Portable Antenna is one of the options you can use to help solve those issues. The VuQube FLEX is great not only for camping or RV road trips, but it’s also perfect for tailgate parties so you don’t miss out on the game. Because it is able to hook up to two different receivers, it prevents family quarrels and gives greater viewing options by allowing you to view two different channels off the same satellite signal. The dual output sets the VuQube FLEX apart from the other King Controls portable antennas. Its versatility makes it compatible with DISH, DirecTV & Bell TV. The simple set up only takes a few minutes, so you won’t waste a lot of time. Being easy to carry not only makes it better for travel, but also makes it easier to find a clear path to the satellite. You’re probably already aware of the fact that you need to pack an emergency kit whenever you are traveling during the winter. When that travel involves an RV, you’ll need a few extra items that wouldn't be necessary if you were traveling by automobile. 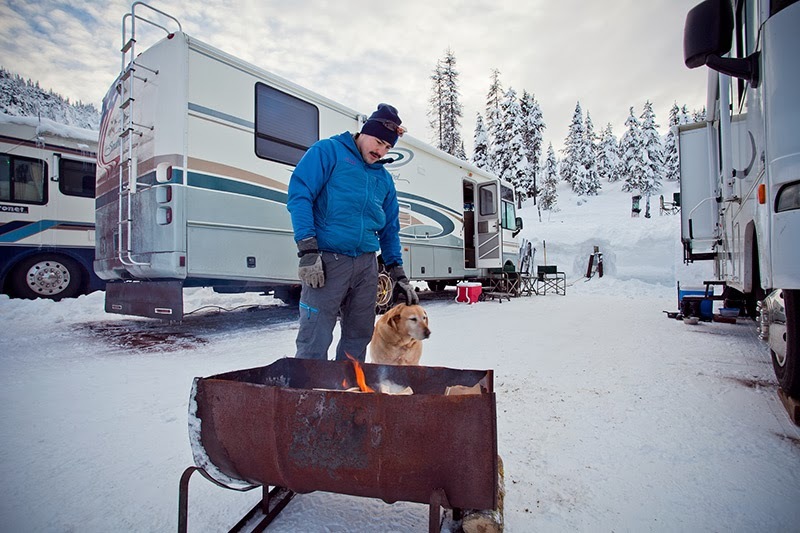 Here are some camper parts and supplies that should be included in your winter RV emergency kit in order to ensure you are prepared for any situation that arises. 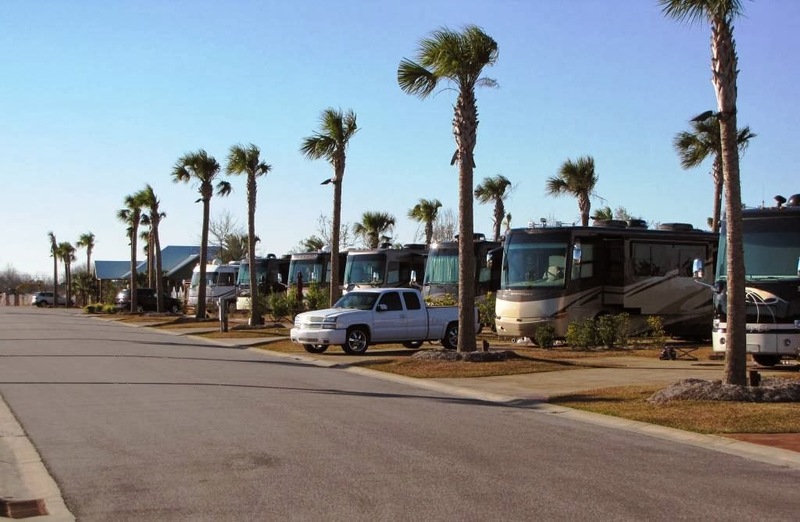 Although not required, you may want to have some additional items on hand just in case you find yourself needing an extended stay at an RV park while waiting on road conditions to clear up a bit. For example, you could find pie irons and hot dog forks to be extremely useful in the event you need to cook over an open fire. In fact, a portable fire ring could come in handy as well, since many locations may not have them out in the off season. Having a few lanterns and some board games on hand can help you pass the time while you are waiting on the snow to clear. Here at the RVupgrade Store, we have everything you’ll need to make winter traveling a breeze. To see the selection of items we carry, visit us at rvupgradestore.com or contact us. Just like on a car or truck, the tire pressure on your RV should be checked to make sure the tires are properly inflated. Maintaining tire pressure is something that often gets missed, especially in vehicles that do not have a sensor built in. Different causes can contribute to low tire pressure, including extremes in outside temperature. Tires also simply lose inflation over time. Low tire pressure can lead to low fuel efficiency, greater wear on your tires or even blowouts. The Doran 360RV Tire Pressure Monitoring System uses sensors on each tire to transmit the current pressure to the display, giving you a clear indication of your tire pressure even while driving. The sensors are able to work continuously, so you will always have up to date information. 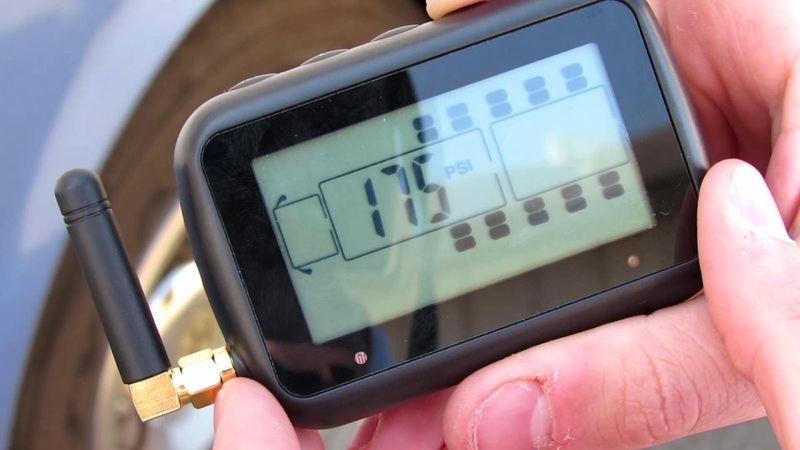 The Doran 360Rv TPMS easily warns you of under or over inflation, using audio indicators in addition to the visual display. It is available in 2 sensor up to 14 sensor versions and is easy to use. The sensors are designed to hold up to outside elements, so they will resist corrosion due to weather. 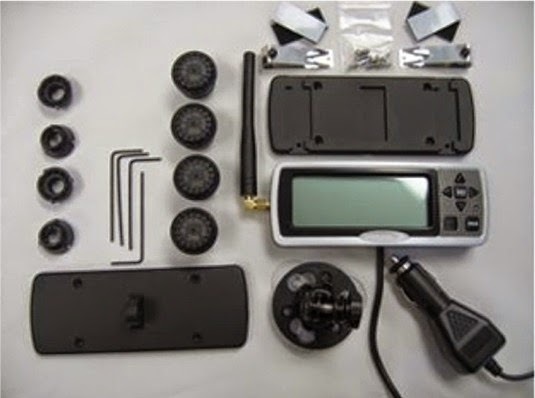 The Doran 360RV TPMS display is also compact in size, so it does not take up a lot of valuable space. While you are on the road in your RV, or if it has been subjected to different weather extremes, it’s always a good idea to make sure the tires have the correct air pressure. The Doran 360RV makes that task much easier to monitor. 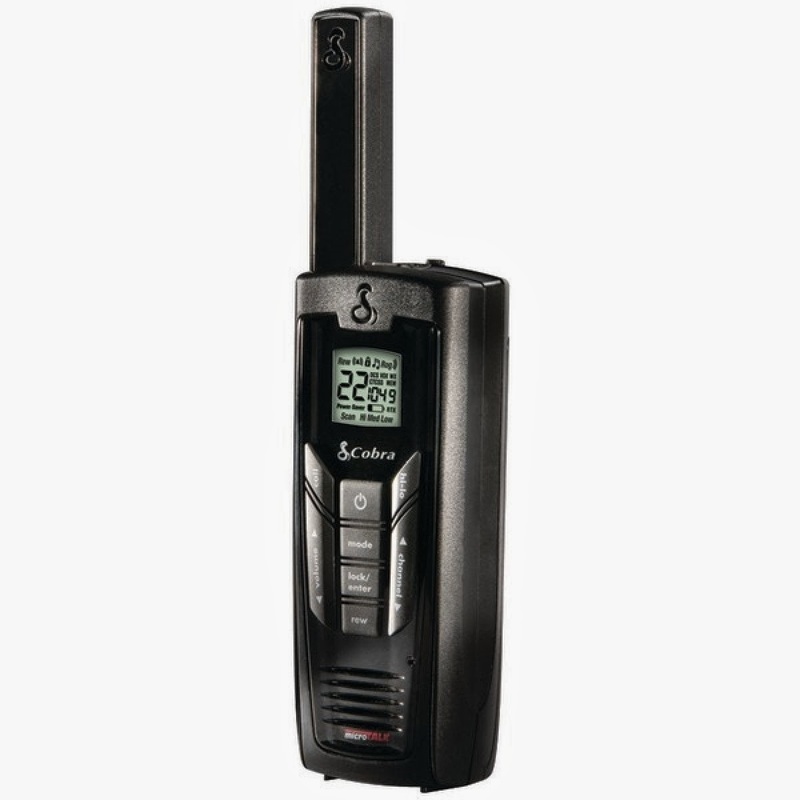 Two-way radios with NOAA channels, like the Microtalk FRS/GMRS, can really give winter campers a piece of mind. They feature phenomenal reception, battery-saving options and the ability to keep on top of changing road conditions. Pair it with a state-of-the-art, RV GPS system and you should be good to go. Engine and tank monitoring systems can also make your winter trips less stressful. Two top brands to consider in that regard are Silverleaf and Seelevel. Silverleaf manufactures engine monitoring systems and Seelevel produces tank monitoring systems. Between the two, they’ll ensure that you know precisely what’s going on with your motorhome’s most important components at all times. Speaking of system monitoring, it’s a well known fact that tire pressure fluctuates due to temperature changes. So you may want to invest in a tire pressure monitoring system, portable compressors and JR Products Snow/Mud Grip Mats. 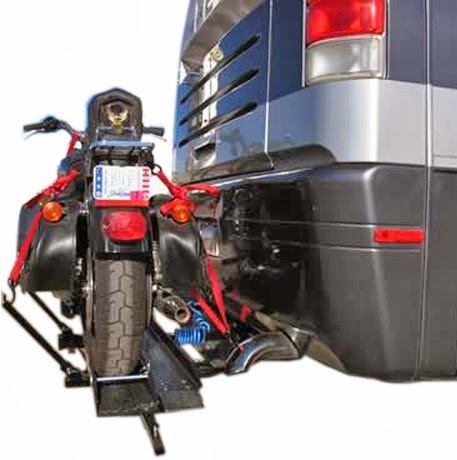 That way, you can stay on top of your motorhome’s tire issues too. A motorhome’s battery can also act up in cold weather. Therefore, it’s always a great idea to store road flares, a battery MINDer and booster cables in your RV as well. One of our favorites is the BatteryMINDer Model 2012-AGM. It works perfectly in cold weather and does more than just charge the battery. Last on our list are portable generators and heaters. They are great to have if the campground that you’re visiting loses power. Of course they could be used at rest stops, parking lots and other areas too. 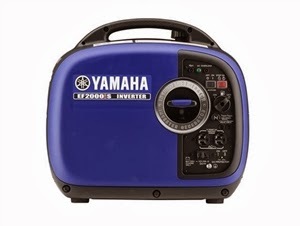 Some of the portable generators and heaters are designed for outdoor use. Others are best left inside of the motorhome. To ask questions and find out more about these winter approved, motorhome accessories, please contact us. Our motorhome accessories experts may be reached online or by calling (866) 332-7881.